In his first inaugural address, Franklin Roosevelt famously said “The only thing we have to fear is fear itself.” Let’s be honest, though—there are plenty of things in this world you may be fearful of. If you walk with fear as a regular companion, however, it creates its own set of problems that go well beyond the thing that generated the fear in the first place. It is a uniquely human trait that we can make ourselves sick through our own thinking and that we can spread ideas to one another at a large scale. Under the right circumstances, which we seem to have at this point in our evolution, fear spreads from person to person, city to city, nation to nation, ever more quickly thanks to our connected world. Indeed, it can act like a wildfire, passing rapidly and destructively from one mind to another. It is hard to remember that this all occurs at the level of thought. Fear has a purpose. It helps ensure our survival. But how can we protect ourselves from the destructiveness of fear, while retaining its usefulness? 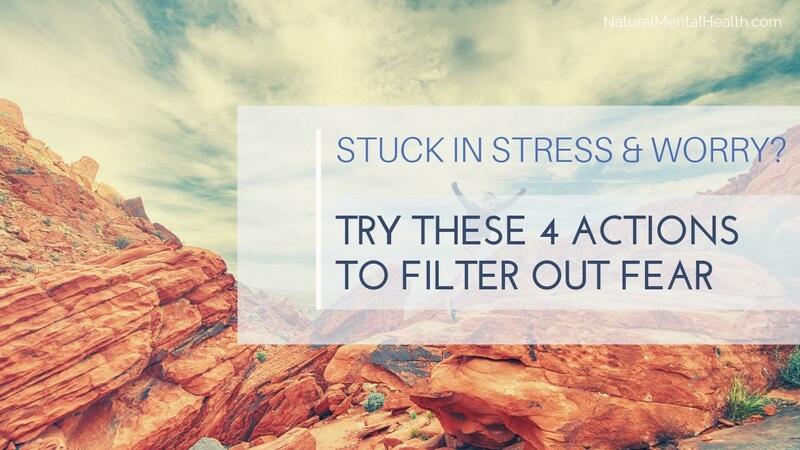 Below are four actions you can take to filter out the harmful aspects of fear. And be sure to watch the Evolution of Fear video if you haven't yet. It explains why your fear might surge so that you can be more gentle with yourself as you take action to calm it. Do you feel more vulnerable, insecure, or rattled after reading, listening, or watching something on the news or social media? You don’t want to put your head in the sand, but it is not denial to consciously choose where to place your attention. What you take in through the mind is a lot like what you take in through the mouth: some things are healthy, others are harmful, and you know the difference by how you feel afterward. Make the healthier choice most of the time. There is a built-in radar in the human mind to look for what’s wrong and what might be dangerous. It’s there to improve your chances for survival. But with real, life-threatening dangers much diminished, and with rampant attempts to manipulate individuals through fear being so prevalent, it's vital to intentionally look for the good that is also around. Think of it like rebalancing an investment portfolio. You are too heavily invested in risky stocks. You could sell some of those and/or buy more of the safer, less volatile investments. Consciously choose to see less of what is wrong with the world and more of what is right with it. It's common practice to put a lightning rod on top of a building. It absorbs the excessive energy of the lightning bolt which could otherwise destroy the building. It has to be grounded (a metal wire that goes into the ground) where the electrical energy can be safely dispersed. Likewise, you can diffuse the excess energy of fear by finding ways to ground yourself. That means doing something physical, tactile, or otherwise engaging your senses. You might stroke something, like a pet or a pocket stone; do an awareness of breath meditation or the yoga mountain pose; use aromatherapy like our Calming Inhaler; or literally contact the earth by laying on the ground, sitting against a tree, or digging in the dirt. Since it is thought that generates fear, you can use thought to mitigate fear. To do so, you need to engage in a practice like mindfulness in order to see thought for what it is. When you learn to observe your own thoughts, and realize that you are the thinker, that your mind is the creator of those thoughts, you can put them in their proper place. You can step back, give yourself a little distance from the thought, choose not to engage it and then see it dissipate, as all thoughts do if we just let them.